Berau District in East Kalimantan has a "paradise" of tourist place that is a pity to miss. One of them is Kaniungan Island. When heading to the island, the travelers who boarded the ship will be escorted by a herd of dolphins that were seemed to give a welcome greeting. This group of dolphins suddenly appeared when the ship drove in the middle of the sea towards the island of Kaniungan. Group of dolphins disappeared in the depths of the ocean, when travelers approached the island. When travelers arrive to the Kaniungan Island, then the white sand will give "welcome greeting". 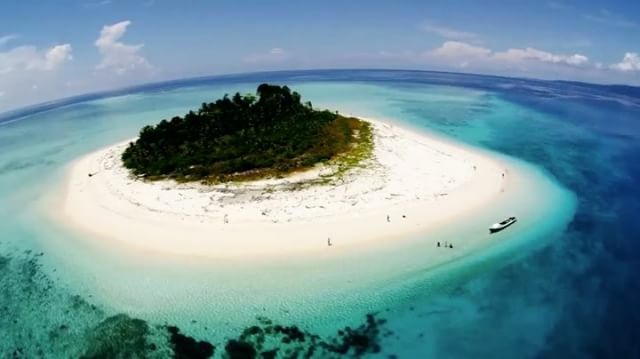 On Kaniungan Island, the area of the white sand is three times larger than Derawan Island, which is already known to many people. Not only enjoying the matural scenery of beach or fishing, travelers can also do playing canoes that are provided by the management of this island. For those who like snorkeling, the traveler can also enjoy the variety of beauty underwater, ranging from the beauty of the island, to the exotic coral reef. Then if you stay for one day one night in Kaniungan Island, later you can see 5 attractions. Kaniungan Island is part of islands in the waters of Berau District. The atmosphere of this calm island is guaranteed to make tourists really enjoy a pleasant holiday atmosphere.